The hope was originally that phone makers would already be in a position to ship devices with 600-megahertz band support, Neville Ray explained to CNet. One of the first 5G phones, the Samsung Galaxy S10 5G, relies on higher-frequency bands that mostly limit it to AT&T, Verizon, and Sprint. T-Mobile's focus on a lower band is deliberate, since while the millimeter wave technology used by AT&T and Verizon has faster speeds, its range is short. T-Mobile has a small number of millimeter wave towers. "You can't go to a U.S. consumer and charge them a big premium and it works on three street corners," Ray commented. One of the carrier's rivals, Sprint, will likewise skip millimeter wave when it deploys 5G in May. Even without it, devices may be able hit speeds as high as 430 megabits per second -- considerably faster than most 4G connections. Sprint CEO Michel Combes said that if a merger with T-Mobile goes through, Sprint will be able to deploy 5G faster and with wider coverage. That deal faces opposition from parties concerned about shrinking competition in the U.S. telecoms industry. Apple isn't expected to add 5G to iPhones or iPads until 2020. That's probably because of its ongoing legal battles with Qualcomm, slow modem development at Intel, and the fact that general 5G coverage should remain small by the time this fall's iPhones are ready. 5G is considered crucial to the advancement of technologies like self-driving cars and augmented reality, both of which Apple is known to be working on. 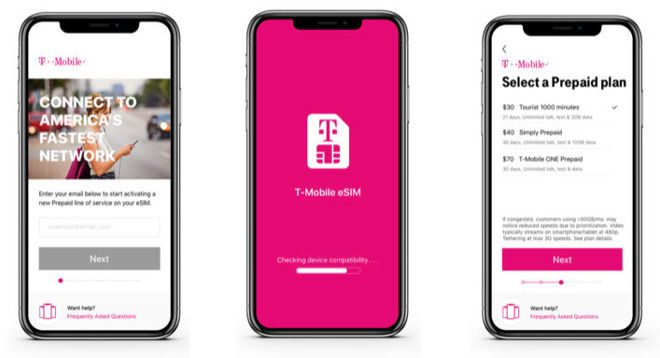 Update: T-Mobile tells AppleInsider that the CNET piece is inaccurate, and that only its 600-megahertz deployment is coming in the second half of 2019. 5G on other bands is still coming in the first half. "Everything is still on track as originally planned," a spokesman said. There is no rush, there are literally NO phones that work on this network yet. My iPhone Max’s Intel modem is clearly inferior to all of my previous iPhones which had QUALCOMM modems. I really hope that the two companies arrive at a settlement sooner rather then later, so that the 2020 and beyond iPhones have QCOM modems. I do have to say the same. It's not as good as the modem that was in my iPhone 6 that my iPhone XS replaced. Not that going back to Qualcomm is the answer. Just that Intel needs to better it's game and/or Apple needs to start making their own instead. Good that my decision for the new smartphone was driven by its 5G capability. There is no rush, but this is a situation where the network needs to be in place before the devices since a single tower does not a network make. Apple seems to be one of the very few not rolling out devices. And that's only because they can't find a supplier for the modems. Meanwhile, 5G will be up and running in major cities and on Android phones at the time of the next iPhone release. Embarrassing for Apple unless they can come up with something before then. It's a chicken-and-egg problem, with carriers saying "no phones" and phone-makers saying "no carriers." The only way to break this stalemate is for the regulators to provide some rules of the road (and for Congress, at a minimum, help speed along the T-Mobile/Sprint merger). So how big is the big premium for 5G that won’t be deployed in a manner that is consistently useful, beneficial to a U.S. consumer? That’s interesting, because my XS is superior to every iPhone I had prior which had a Qualcomm modem. In fact, I’m regularly with someone who uses Verizon with an S9 and a Qualcomm modem and the reception and performance is pretty much equal to my XS on T-Mobile with an Intel modem. We can’t make a blanket statement based on our own experience and the loud voices of select people where we can’t be sure how well they represent the public overall. I don't think regulations would necessarily be a good idea here - congress moves infinitely slower than technology and they are even slower to update regulations that are outdated. I'd be afraid the regulations would end up compromising things more than helping. All of the networks are pushing towards 5G and I think market competition will be enough to push the rollout. Having good 5G coverage will be an important selling point, just like 4G/LTE coverage was a few years ago. I wasn’t thinking of the Congress, but rather, FCC and the US telecom authority. I brought up the Congress in relation to the springt-TMobile merger. The networks and the 5G phones are rolling out together starting with this year. Apple apparently won't be one of them only because they can't find a supplier rather than any technical reasons. Not really, All three major U.S. carriers are planning to start rolling out 5G this year and there will be plenty of 5G phones available. Apple won't be one of them only because they can't find a supplier. The only thing the government could do to speed it up would be to drop this silly anti-Huawei / MAGA stuff. They seem to have the cheapest and best 5G equipment. The same arguments were likely made for the horseless carriage. Thankfully they were ignored. As for the iPhone, 2-3 years from September a phone limited to 4G will be quite obsolete. But that is what Apple will likely be selling -- not for any of the reasons you sited -- but because they can't seem to find a supplier. Qualcomm is off the table. Intel can't. And Huawei is being attacked by our president. In the spring of 2021 your iPhone XI will be a year and a half old. Do you intend to buy a new one in order to play catch-up? THAT is the issue.